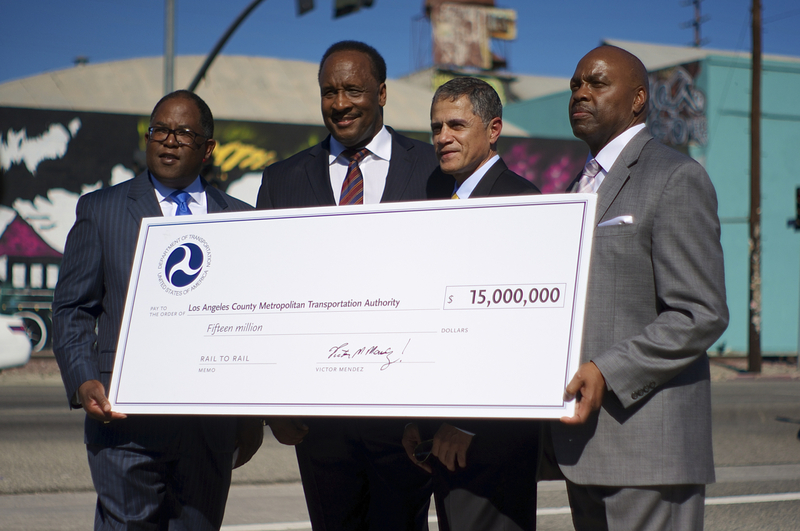 L.A. County Supervisor and Metro Board Chair Mark Ridley-Thomas, Inglewood Mayor and Metro Board Member James Butts, Deputy Secretary of Transportation Victor Mendez, and Metro CEO Phil Washington hold the ceremonial check granted to the Rail-to-River project set to run along Slauson Avenue in South L.A. Sahra Sulaiman/Streetsblog L.A.
Preferably with another $15 million grant in hand, he joked. He might have been referring to the fact that Metro originally anticipated receiving $21.3 million from the program — not $15 million. But the fact that L.A. got $15 million at all is still a pretty big deal. There had been 627 applications from all 50 states and a handful of territories for the U.S. Department of Transportation’s (USDOT) Transportation Investment Generating Economic Recovery Grant (TIGER) VII program and only 39 grants handed out, Mendez told the small crowd of press and staff gathered in the east parking lot for the Metro Silver Line at Slauson and Broadway. The Rail-to-River project, he said, had stood out as an opportunity to turn a 6.4-mile stretch of a “dormant” and “blighted” rail right-of-way (ROW) in a “historically distressed area” into a biking and walking path that could more efficiently connect people to transit while also bettering the local economy, health outcomes for residents, and the local environment. Given projections that the U.S. population will grow by 70 million by 2045, that freight volume will grow by 45%, and that existing infrastructure will not be able to meet either of those demands, he continued, citing the USDOT’s Beyond Traffic 2045 report, the time for alternative transportation projects was now. First proposed by Ridley-Thomas and Supervisor and Metro Board Member Gloria Molina in 2012, the project looked to temporarily convert a rail ROW deemed infeasible for passenger rail in 2009 (see Harbor Subdivision study here*) into a community asset in an intensely park-poor neighborhood. 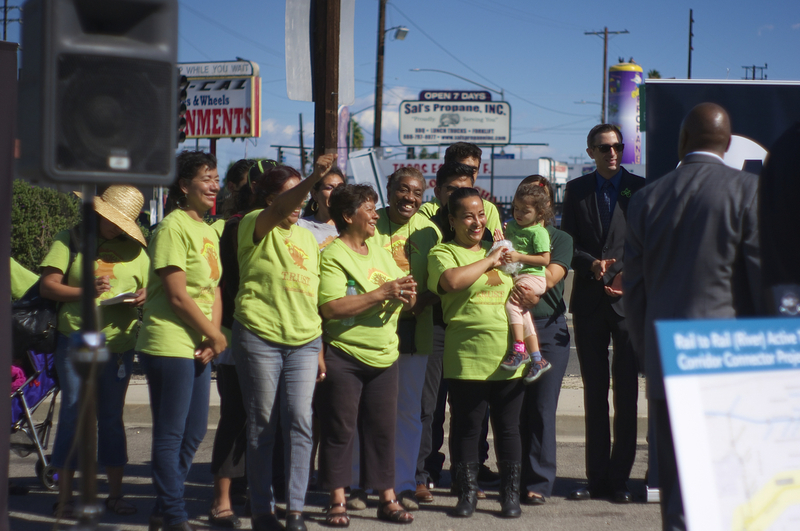 The Slauson corridor that runs through South L.A. takes another step forward toward becoming an Active Transportation Corridor. Much of the corridor looks like it does above — abandoned tracks buffered by several feet of mud or gravel on either side. Sahra Sulaiman/Streetsblog L.A.
On October 23, 2014, the Metro Board of Directors voted to adopt the Rail-to-River Intermediate Active Transportation Corridor (ATC) Feasibility Study and directed staff to identify funding for full implementation of the project. At that time, the Board also authorized $2,850,000 be put towards facilitating the environmental, design, alternative route analysis, and outreach work required for the project to move forward and requested the staff report back in May of 2015. While there was very, very little in the way of outreach — throughout the feasibility process Metro representatives said they were reluctant to let the community know about the project because they didn’t want to get the community’s hopes up — the report staff made in May was in favor of moving forward on the project. The Board then authorized the allocation of up to $10.8 million in hard-match funds to meet the requirements for the TIGER grant. Those local funds would be in addition to the $8.4 million in hard-match funds to be supplied should Metro win an Active Transportation Program (ATP) grant for $9.6 million, making Metro’s total contribution for this phase up to $19.3 million. In its entirety, the path may run more than eight miles, connecting users to the L.A. River via Randolph St. (below). But because the final configuration has not yet been confirmed, Metro appears to be focusing on getting the portion of the trail highlighted in yellow (in the map, above) underway. 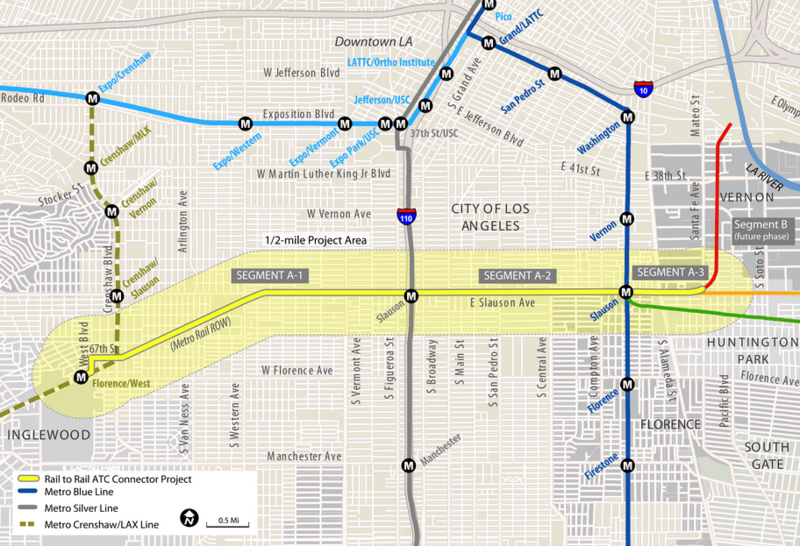 Because of this hold up on phase 2, the initial phase is currently being referred to as the Rail-to-Rail project, and will connect users to the Crenshaw/LAX, Silver, and Blue Lines. But at least the TIGER grant will help Metro get that first phase underway by putting the project on a bit of an accelerated schedule: the funds need to be obligated by September of 2017 and expended by 2022. 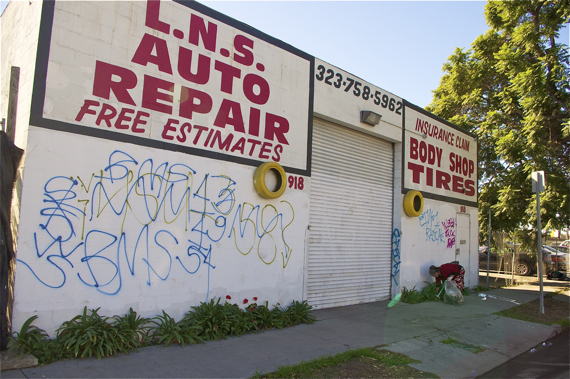 The project has the potential to effect a significant transformation in an area of South L.A. once governed by racially restrictive covenants that kept African-Americans from being able to own property outside of the area bound by Slauson, Main, Alameda, and Washington. The community hasn’t seen a whole lot of investment since those early days, minus, of course, the Crenshaw/LAX Line (currently under construction) and the pending and controversial billion-dollar Reef project slated for Washington and Hill, just south of downtown. Which may be why Mark Ridley-Thomas repeatedly referred to his mission to make the corridor safe, attractive, and accessible for residents as well as his hopes that it would “become a destination unto itself” and contribute to the economic transformation of the area. That vision for it to be a “destination unto itself” is one folks in the community are very much on board with. TRUST South L.A. organizers and volunteers (and Eric Bruins, Planning and Policy Director at the L.A. County Bike Coalition, at right), came to show their support for the project. Sahra Sulaiman/Streetsblog L.A.
McNeill spoke of how TRUST’s community organizers and volunteers — many of whom were on hand to celebrate the victory (above) — had spent a few evenings reaching out to cyclists at several intersections along the Slauson corridor. Of the 123 cyclists they had surveyed, she said, they found that 34 (28%) had been in collisions while 83 (67%) used bikes as their main mode of transportation through the area. Their figure for collisions between bikes/pedestrians and cars skews a bit higher than current estimates, as people in the area tend not to report crashes. 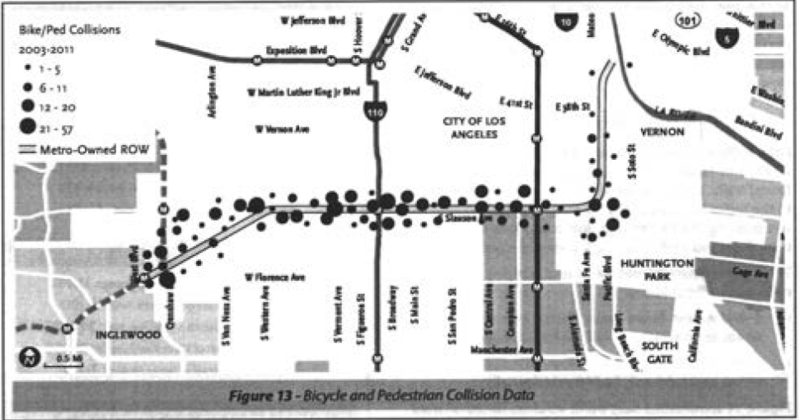 Meaning, unfortunately, that Metro’s already ominous map of reported collision data (below) should probably be more heavily populated and with bigger circles. The project should be able to mitigate some of those issues with the enhanced crosswalks planned for a number of its crossings. But McNeill also has her sights set on more than just making connections to transit. She’s right — it is. And it is also necessary. For the corridor to be successful and a true an asset to the community, it needs to be more than an active transportation path. As noted in a previous article, gang activity is prevalent in several of the neighborhoods along the corridor. So, for people to feel safe walking or biking along a path that is largely bordered by windowless industrial buildings, the more activated it is, the more accessible it will be for all. Fitness equipment, art, lighting, seating, picnic areas, shaded areas, vendors, and other interventions will help bring families and residents out to take advantage of the space. Partnerships could help, too. Collaborating with local high schools like Augustus Hawkins, a school that has a robust social justice-oriented community engagement program, to design or activate sections of the path could help students take ownership of the project and feel more comfortable using it to get to school. Working with St. John’s (the clinic that put garden boxes in along 58th St. to benefit their diabetes patients) and other area clinics on how to activate the space via fitness, gardening, or other sorts of clubs might ultimately result in better health outcomes for local patients. And working with the local vendors in the area — many of whom who are local residents and who have been cooking for other residents for the better part of a decade (or selling them tools for more than 20 years, in the case of one man) — will help ensure that the steady stream of regular visitors they attract on the weekends makes the corridor feel like an extension of the community. The potential of the corridor is tremendous, in other words. What remains is for Metro to support a robust community engagement process from the outset and to seek to incorporate into its plans the kinds of interventions and activations that will enhance local residents’ access to the area. Metro’s Phil Washington, who has come to Los Angeles speaking of Transit-Oriented Communities rather than Transit-Oriented Development, might just be the person to push that more community-specific approach. Speaking to those gathered at Slauson, he underscored his interest in seeing Metro make this a project that benefited local residents. 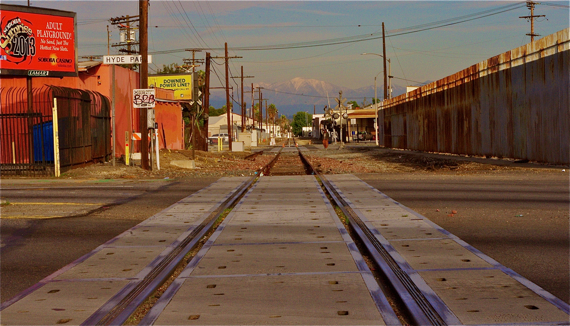 The tracks at Crenshaw, looking east. Sahra Sulaiman/Streetsblog L.A.
*The decision to turn the Harbor Subdivision corridor into a (temporary) bike and pedestrian path that preserves the ROW in the event it should become feasible to construct rail there at some future date has been angrily debated in each of the comments sections of previous articles on this project. Should you feel the need to once again vent your anger over the decision to stop holding the community hostage to blight while waiting for rail to become more feasible, I suggest you channel said anger more productively by contacting Metro directly. Thank you. I call BS that transit isn’t feasible on this ROW. What a missed opportunity. Dude, read the last paragraph of the article! In a variety of projects reported on (by various news agencies) around the city and county, there seems to be a real lack of “community engagement” involved in the development of the projects and funding for them. How can this be solved? Further, I am still thinking of your (Sahra Sulaiman) talk at the Cal Bike Summit last Monday. How did $2.8 million dollars get spent to develop a park without community engagement? Who made the decision to construct the park without reaching out to the community? The astounding result of which due to gang activity is “useless” — unusable. Change needs to occur, where do advocates start? I was thrilled to read that this corridor got federal money to be used to build a mixed use path. I’ve wanted to have mixed use paths through all areas of LA, much like there are paths across the San Fernando Valley. They are used like a linear park. Which means that not only do they provide a more comfortable way to get to some destination by human power, but also a place to stroll along with pets, friends or children. Where is the space for vendors? The vendors in the above picture near Avalon would take up the entire width of the 17′ wide mixed use path depicted above by Alta Planning, thereby blocking the path for transportation by bicycle. The lighting and shading would take up almost all of the space not used by the path. Where would you propose making a picnic area along the route that starts at :44 seconds at Slauson/Santa Fe in this video? This is a corridor lined with industrial buildings. I don’t see either the room or the need for a picnic area there. However, I do see the need to have a easier way to access the stores at Slauson/Central and the Blue/Silver and Crenshaw lines by using inexpensive human power. By far the most difficult part of the route to make comfortable enough to bicycle or walk along starts at 2:24 in the above video. It would feel like going through a tunnel where you could get trapped in a threatening situation. There are sections that are wide. Vendors work there quite comfortably now. Just because you are unfamiliar with the area and don’t see the need for something doesn’t mean there is not a need for such a thing. Vendors do quite a bit of business there on the weekends and are a staple in the community. The gentleman that sells tools has been there for over two decades. The man who sells dog houses sets up on a quiet intersection. 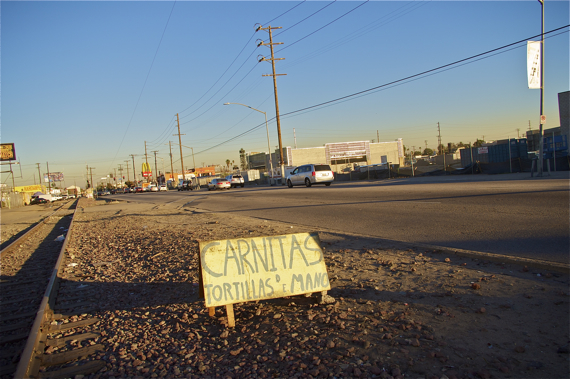 The other vendors are set up at wider spots between Main and Compton. Their presence makes the area more welcoming, and many of them live in the area. Planning with the potential for a multipurpose path/greenway makes it easier for these things to become a reality. Thus far no such effort has been made to do so. I am asking that they start thinking more about the community now. Can you make with the details of who to contact @ metro? Vendors are comfortable there now because its an abandoned railroad right-of-way that hasn’t been used for years by the railroad. They have simply been setting up shop on space that is not used for anything besides what they use it for. Alta Planning is very clear in their rendering above on how much right-of-way is available. Its 20′-25′ for a access road and 25′-30′ for the railroad right-of-way. The mixed use path would take 17′ of that railroad ROW. Then there is 5′ of space between the road and the path. Also, another 3′-8′ on the other side of the path. That doesn’t leave enough space for those large canopies and smokers of that vendor near Avalon pictured above. Are you saying that they should have squatters rights and be able to set-up their smokers and canopies right on the mixed use path during weekends, because that will be the only space available that would be wide enough to accommodate all of that? It will be much, much harder to install the mixed use path if there has to be space devoted to the vendors. Not only is there a fixed amount of space, there is also a fixed amount of money that can be used. Examples of what can be accomplished with a limited budget are the mixed use paths in the San Fernando Valley. There wasn’t enough money to install bicycle specific signals at the intersections along the Orange Line path, nor along San Fernando road. The mixed use path than runs down the median along Chandler Blvd in the city of Burbank has art, seating, and foliage, but no pedestrian level lighting because there wasn’t enough money available for that. The street lights on either side provide some dim lighting. The section that is in the city of Los Angeles has pedestrian level lighting, seating, but no art. Neither of these paths has bicycle specific signals–because there wasn’t enough money. Thank you for all of the work that you have done to expose the problem. We need more professionals like yourself to raise awareness of the issue of lack of community outreach by public agencies. Metro has found itself under scrutiny lately with respect to other transit projects. Their commitment to outreach falls into the category of “sub-standard” to say the least. Hopefully, Mr. Washington can correct these “gross errors” and start to set Metro on a decent path in the near future. Until then, reporting can make a large difference by bringing to light these issues for us to raise awareness. We can start to write our local politicians and ask informative questions or hold them to a greater accountability over the decisions that are made as representatives on their respective boards (i.e., Metro, Metrolink, etc.). Thank you for the reply. This used to be an active industrial railroad with lots of industrial businesses receiving and shipping goods by rail. I guess it isn’t any more. That’s the source of the blight, of course. What I am saying is that there is a community there and they need to be engaged. Alta did not do that, and knew next to nothing about the community and assumed this corridor to be empty. It is not. South LA is not North Hollywood/the Valley. This path needs to work for the community, not for North Hollywood/the Valley. To make that happen may require the cobbling together of different sources of funding and a more creative design that preserves space for a path but allows for a wider range of uses. Whether that is possible remains to be seen — those options were not really entertained in detail before, although some options were tangentially. So just chill already. I’m amazed at how often planning firms — which are inevitably local — fail to do a basic *walkaround* before coming up with design plans. I mean, this seems bloody obvious to me. It isn’t even community engagement! It’s just learning the territory. It seems like malpractice to not do it; if they’re local to the LA area (as opposed to, say, being based in London), it costs them very little to go over there for a day or two and *take a look* and *ask the neighbors about it*. Alta Planning didn’t have to engage the community for what they were hired to do. Their work involved figuring out how much space there is in the railroad right-of-way, the width of the sidewalk on the other side of road, the road lane widths and the width of the access road between the the railroad right-of-way and the buildings. That railroad right-of-way is owned by the railroad and not the vendors. Are the vendors paying rent to the railroad for the use of that right-of-way? The vendors are simply using a dormant railroad right-of-way that they don’t pay to rent, nor do they have a building on it. Due to the finite amount of space within the railroad right-of-way its likely a either or proposition. Either there will be a mixed use path along the sections where some of the vendors are or else the mixed use path should end and start up again after the vendors, or the vendors should have the right to set up shop right on the path. Which means anyone on a bicycle would have to dismount or else ride in the street where the vendors are. The vendors near Avalon Blvd in the picture above are taking up most of the available railroad right-of-way space. The reason the vendors take up so much space is that its available. Perhaps it should be like the sidewalk on Alvarado Blvd between 7th St and the MacArthur Park subway station where vendors take over most of the space on the weekends. Which would mean that bicyclists should ride in the street to get around them. Another option would be to knock down some buildings to provide space for the vendors or build a platform over the path for the vendors–then again, how would they haul those big smokers to and from that platform. Maybe a freight elevator could be built just for them. The whole idea of accommodating that size of business along this narrow right-of way just looks ridiculous. It would impede the ability to get the path built. I know that area is not North Hollywood. The point I was trying to convey was there is a finite amount of space available and a limited amount of money. In fact, its going to be a stretch just to come up with enough money to build the mixed use path. When you start adding in this, that and the other it makes it even more difficult to complete the project by raising the bar on what is to be expected. As it stands now its a simple project that can be delayed or even stopped by unreasonable demands that go far beyond the space or money that’s available. Engaging the community and doing what they recommend could end up with no mixed path. Its unlikely that many of them walk or bicycle along that corridor. They might think it would be more useful to them if Slauson Ave was widened to make it easier for them to drive and perhaps even use the space to build parking lots for vendors. After all, driving is the main form of transportation in that area. I recently did 2-hour bike/ped counts at 24 locations for the Los Angeles County Bicycle Coalition. These included northeast LA, east and west side of the valley (including Pacoima), Hollywood, Chinatown, Watts, USC, Santa Ana at Wilmington, Century Blvd just west of Vermont, Budlong at Century Blvd, MLK at Central and Central at 54th. 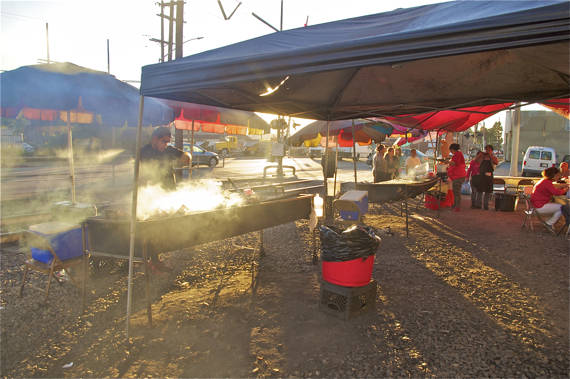 Although I was a handful of blocks north of Slauson at 54th on Central Ave, I did have a vendor set up a portable barbecue about six feet in back of me in a parking lot. If there were more space available, I’m pretty sure that there would have been an even greater number of vendors in the area. That’s not Slauson where the railroad right of way is, but I can’t say I’m totally unfamiliar with the area after spending hours standing around observing the activity on Central Ave and other locations in south LA recently. I’m not mentioning that to brag, I’m doing this because you seem to assume that I haven’t got a clue about the area or what their needs are. If Metro adhered to whatever the community demands are for their other capital projects, then there wouldn’t be a Orange Line busway going through a Orthodox jewish community in the valley. A group of them in fact got a state law passed that they had hoped would prevent a busy transit line going through their area. They were shocked and angry to find out that there was such a thing as a bus rapid transit system that emulates a rail line and one was going to be installed down Chandler Blvd in their area. The state law that was passed prohibited any rail line from being installed in the old ROW along Chandler Blvd in their area. Also the Expo Line would not be going through Cheviot Hills and the Purple Line extension would certainly not be going under Beverly Hills high school if Metro had followed the wishes of some community members. Several commercial buildings were demolished along the Orange Line right-of-way as there probably were along the Expo Line. Several of these businesses had been there for decades. One business along the Orange Line ROW refused to leave, evidently successfully sued Metro and as a result the path and busway had to move around this business called the Red Barn which is just west of Reseda Blvd. Following all of the desires of community members would be like planning by divining rod. Very little would ever get built. Its almost impossible to please everyone. From my observations standing for hours counting pedestrians and bicyclists in south LA and seeing people who obviously live in the area that are likely low income driving expensive cars, or are waiting at bus stops that has infrequent service, I see a great need to make it easier for them to get somewhere by the inexpensive use of their own human power. Also that the land use requirements should be changed to allow at least 4-5 story buildings to encourage development. Riding past the Staples Center on the Blue Line and seeing other large buildings going up in that area that are being built by billion dollar corporations, which likely got tax discounts from the city, makes it obvious where development is being encouraged. But that’s another topic altogether. The mixed use path that connects to the Blue, Crenshaw and Silver Lines would make it easier to access jobs. It will also provide a way to get to the mall located on Slauson at Central where there is a large grocery store. There is not only few parks in south LA, but also a lack of conveniently located grocery stores. Most of my pedestrian counts on Budlong at Century were of people going to or from the liquor store located on the corner of my side of Century Blvd. That seemed to be the equivalent of a convenience store for them. The opportunity for a mixed use path along Slauson should not be killed off by community demands that exceed the ability to fulfill them. The benefits of this mixed use path is far greater than the loss of vendors. They can relocate, the path cannot be installed somewhere else in the area. I agree Dennis, we need to keep our eyes on this project closely. 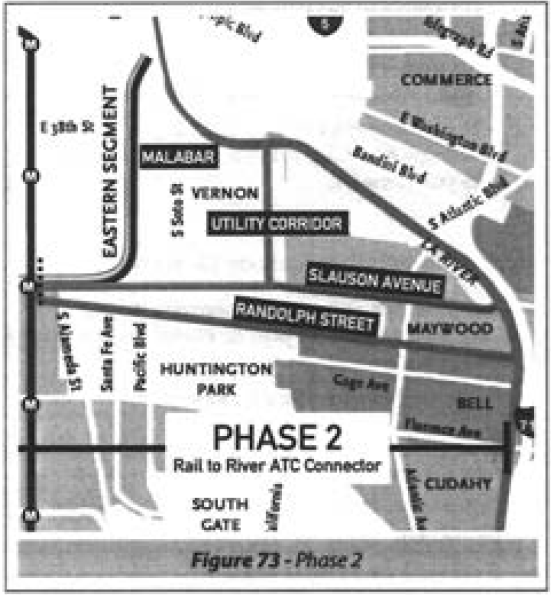 While the community needs to be involved, it also needs to address the needs of the wider area as well as this is an important connector for the region – I could see this is a path for service workers from areas east of the Blue Line, like Huntington Park, to connect to the Crenshaw Line and save themselves a transfer. So telling anyone to “just chill” is not productive. Chill. No one is interested in killing the path. No one has suggested such a thing. And no such idea has come up, nor do I expect it will. The question is how to make best use of the space around it so that it is inviting and accessible to the community. Which is not something Alta did. In part because they were not really given that mandate. But also in part because they treat community specificity as an afterthought. So just chill already. 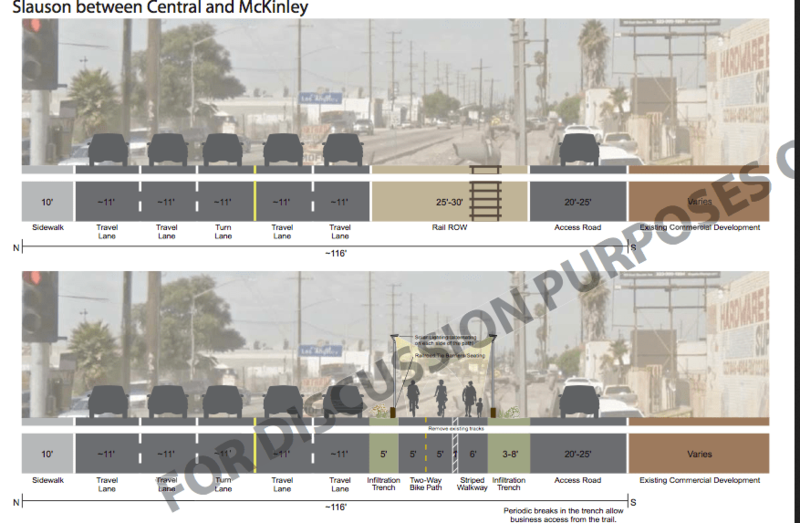 The LA county MTA produced final feasibility study dated 10/01/14 does mention the possible uses for a large parcel that they own next to the ROW between Central and Hooper that was a rail depot. This is on page 27, section 3.2. It lists several potential community uses including ‘Indoor commercial exhibit space for small format vendors – providing an opportunity for existing non-permitted vendors along the corridor to concentrate in one location as part of transit hub.’ There is also outdoor space that it mentions could be used for existing vendors or food trucks. Potentially the site could also be used for job training, a community center, farmers market, rest stop/interpretive space for active transportation, bike repair, bike rental, etc. So there is enough space for existing non-permitted vendors, just not along the rail ROW. I’m sorry, but this is the most pathetic use of an old right-of-way. Why not reactivate this line as a heavy rail that can connect Union Station to LAX? How will this park/bike be maintained by the city and who will want to actively use it when the area surrounding it is nothing but industrial blight? The area will be much better served by reactivating it. Having redundant transit lines makes for a more robust transit system overall. One “why” is that bike-ped facilities cost pennies on the dollar compared to the rail you’re envisioning. Metro doesn’t have the budget to convert this to a Metro rail line in the foreseeable future. If, in 20 years, we need to reconsider the decision, this could become a rail-with-trail facility. In the meantime, it will serve communities that lack safe spaces for walking and bicycling. I can see this point of view, however, spending money on making this a greenbelt/bike path then possibly converting it into rail later doesn’t make sense to me. I would rather see Metro wait on this until funding becomes available. Metro is not interested in using any of the old dormant railroad tracks that they own as heavy rail. If they decided to put a transit rail line down Slauson, then it would be light-rail and they wouldn’t use the existing tracks, these would be ripped out. The fact that there are train tracks there is irrelevant. Metro has not used any of the existing dormant tracks on their other rail projects. Well, it’s a missed opportunity and too bad for us and Metro. I could even see the Red/Purple line being extended from the railyard in the Arts District along the Slauson line to LAX. Metro has in fact used existing dormant lines in their projects- the Blue line (old PE line) and the Gold line (old Santa Fe line from CA to IL). It’s not a missed opportunity. The Red Line is a third rail electrified train. Metro is not about to put that on street level where people could electrocute themselves. That technology needs to be grade separated. Either elevated or in a tunnel. Your stating that Metro used the old existing railroad tracks when the Blue and Gold line were installed? Using the railroad right-of-way was not what I was referring to. The Orange Line, which is a old railroad right-of-way, had commercial buildings located along its ROW. Having those buildings there didn’t create a lost opportunity, Metro simply told the users to leave and tore down the buildings when the Orange Line was built. Ripping up the old rail tracks to install the brt line wasn’t a lost opportunity either. There was a state law passed that prohibited surface rail from running along that corridor. That bus line has carried millions of passengers per year. The alternative was to have it remain a rusty rotting dormant rail line with weeds growing along it to this day. Putting a bus line on that corridor will not prevent a future upgrade to a rail line. That wasn’t a lost opportunity. The brt made that into a transportation corridor once again, just like a mixed use path along Slauson will add transportation enhancements to that corridor. In fact, even Robert Moses did this before he smashed his highways through neighborhoods. Having lived in this community all my life I am truly optimistic of the great prosperity this can bring to us here. Lets keep fighting to make our community a better place for our children! Shakeup at Metrolink Board: Najarian Out. Ridley-Thomas In? Ridley-Thomas, South L.A., Gearing Up for Fight Over…Light Rail Yards?